Today I propose to you 7 nice games about driving, they are all open source and freely downloadable. I’m not a great fan of this genre but I’ve played some of them and they have great graphics, and you’ll not miss what you can find on a Windows Computer. VDrift is a cross-platform, free/open source driving simulation made with drift racing in mind. The driving physics engine was re-written from scratch but was inspired by and owes much to the Vamos physics engine. VDrift was created by Joe Venzon in early 2005. A fan of Gran Turismo, Joe had a lot of fun trying to drift in GT4, though he was disappointed with GT4′s physics after loss of traction. Looking around online, the open source Vamos Automotive Simulator performed much better, although the graphics and features were minimal. Building around Vamos, using code adapted from his earlier 3D engine experiments, Joe created the first version of VDrift. TORCS stands for The Open Racing Car Simulator. TORCS is designed to enable pre-programmed AI drivers to race against one another, while allowing the user to control a vehicle . Speed Dreams is a 3d cross-platform, open source motorsport simulation and racing game. 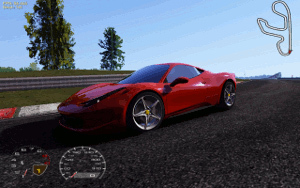 Speed Dreams is a fork of the open racing car simulator Torcs started in 2008, it has now reached a clearly higher realism level in visual and physics simulation, thanks to its active development team and growing community. It mainly aims to implement exciting new features, cars, tracks and AI opponents to make a more enjoyable game for the player, while constantly pushing forward visual and physics realism. 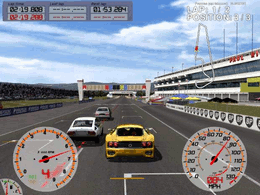 Speed Dreams features several different racing modes; while some offer greater customization than others, most generally try to reproduce real types of races. Complex events, such as various categories of championships or endurance races, are also available. Because racing modes are defined by plain-text configuration files, custom ones can be freely created. 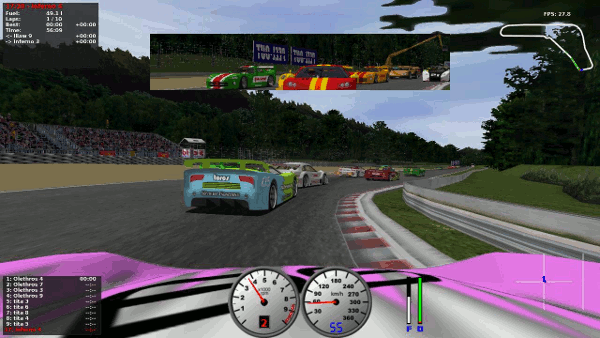 In this context the most relevant change since TORCS − introduced in Speed Dreams 2.0 − is the “Career” mode: here the player can compete with different car classes, during multiple seasons, on randomly selected tracks and against balanced random opponents, earning points in championship rankings. Speed Dreams 2.0 introduced the simulation of a real sky dome, along with customizable weather conditions: the user can choose the time of day, the cloud cover and the intensity of rainfall to have during the race. The sky dome can be set up as dynamic, namely simulating the succession of day and night and the movement of celestial bodies. SuperTuxKart, also known as STK, is a Mario Kart-like arcade racing game featuring the Linux mascot Tux. STK is cross-platform, running on Windows, Mac OS, Linux and other Unix systems. Basically, you run a certain number of laps and try to be faster than your opponents. Power ups, like accelerator, rockets, can help you to achieve this goal. By collecting coins you build up your power, which enables you to get more power ups whenever you collect one. SuperTuxKart’s gameplay is similar to Mario Kart, but has become more unique over time. The characters in the game are all open source software mascots, such as Tux from Linux, Konqi from KDE, GNU, Suzanne from Blender, and Wilber from GIMP. Nolok, the main antagonist of Supertux, also makes a playable appearance. Also, the Mozilla Thunderbird is the race referee. SuperTuxKart is availabe on Debian, Ubuntu and Mint repository or on getdeb repository. The game is also available for most of the most common GNU/Linux distribution, for a complete list check the download area of the official website. Racer is a free car simulator project, using high-end car physics to achieve a realistic feeling and an excellent render engine for graphical realism. Cars, tracks and such can be created relatively easy (compared to other, more closed driving simulations). The 3D files, physics and other Racer-specific file formats are documented. Editors and support programs are also available to get a very customizable and expandable simulator. OpenGL is used for rendering. Although Racer started out as a driving simulator, it also has features that are usually seen in racing games, such as racing against AI cars, or against human opponents in multiplayer mode. Among its strong points are a very realistic physics engine (also used in a commercial racing simulator), and good graphics. The great graphics come from an advanced shader system, allowing live reflections and other effects. Its weak points, when compared with commercial racing games, is the absence of wear/damage physics or a career mode. An important characteristic of Racer is its openness. The software itself is maintained exclusively by creator Ruud van Gaal, but the formats for cars, tracks and other data are documented. Furthermore, tools to aid in car and track creation are part of the release. As a result, a large number of cars has been created and published, in a large variety: Formula One, GT, vintage, trucks, daily drivers, luxury sedans…even a shopping trolley has been modelled. Likewise, tracks are available in various types, from true racing circuits to drag strips, mountain roads, and even a car park. Sadly the linux version is lagging behind, and so to have the new release with all the fancy options you have to use the windows version and run it with Wine. Trigger Rally is a free 3d rally car racing game. You race a sequence of 6 courses, with increasing levels of difficulty, it’s been tested also on machine with not much graphical power (701 EEE PC) with good results. Packages available for Arch Linux, Debian, Gentoo, NixOS. OpenSUSE, Ubuntu and as Ubuntu PPA. It’s possible to play Racer Trigger Rally’s newly-launched Online edition – playable right from your browser and powered by WebGL and Three.js. Like the name said this is a stunt rally game with a Track Editor, based on VDrift and OGRE. Tutorials and Championships – drive a series of tracks to get higher score. The game is available on Desura, getdeb (fro Debian. Ubuntu and Mint), or you can grab the source package from the official page.